I got my first taste of Telltale Games’ episodic game format last year, when I played through the first two episodes of The Walking Dead at a friend’s house. It was surprisingly engaging, considering it was essentially an interactive story more than a full-fledged game. It harkened back to the old point-and-click PC titles, with quick-time events sprinkled throughout to push the survival horror angle more obviously befitting The Walking Dead. Its cel-shaded comic book styling was gorgeous, but when I heard about their follow-up series, The Wolf Among Us, I was initially skeptical. It seemed too easy a cash-in, and I wondered how they could successfully pull of a story from the Fables world with the gameplay elements cemented in The Walking Dead. Having just wrapped up my playthrough of the first episode of The Wolf Among Us, I can say that Telltale Games has handled this fantasy property just as well as their first installment of the zombie survival tale that made them a household name. Fables is a very different tale to tell than that of The Walking Dead, for a number of obvious reasons, and Telltale seems to have taken that very much into account with the way they have chosen to push the detective angle of Bigby Wolf’s attempts to piece together a string of crimes carried out against his fellow fables. 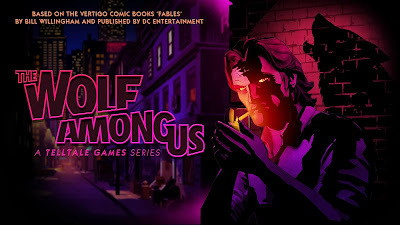 The Wolf Among Us pits Bigby in some rather intense scuffles with other powerful fables, but the majority of this first episode focuses on dialogue selections, scouring crime scenes for clues, and narrowing down the big bad wolf’s field of suspects. The colorfully decaying streets of New York City in the The Wolf Among Us look every bit as good as the drab and dismal forests, farmland, and ghost towns of The Walking Dead – a testament not only to Telltale’s ability in crafting these worlds, but to the cel-shaded graphics carried over to this new game as well. The accents the characters bear, their mannerisms, and their classical fairy tale origins all culminate into one wonderfully immersive cast. It’s a truly impressive feat that a single episode that runs less than two hours can set the stage for a fantasy world and sell it so well to someone like myself who is only passingly familiar with the comic book source material. In fact, The Wolf Among Us does perhaps better to pack in so much quality in that brief time period than most of the triple-A titles I played during the last year. Now, that is not to say that the game is perfect – there are some current hiccups with the season pass not granting people immediate access to the second episode. I also noticed a few instances of lag during the action segments, which are arguably the most crucial moments for delivering a quick response. Still, it’s nice to see that developers in this day and age can deliver high-quality games without creating an overly-complex system of gameplay or charging full retail price for their product.